Do you have a best friend? Why do you like them? 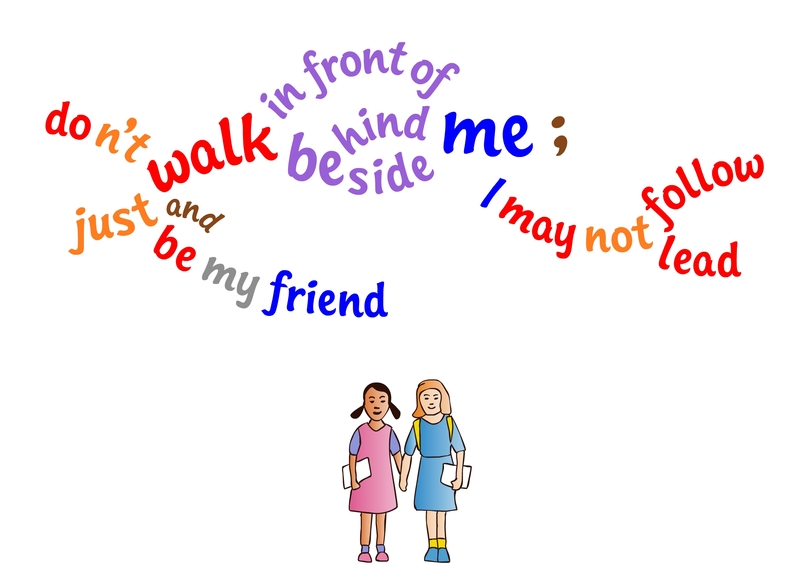 Try to work out this quotation about friendship. It is by Albert Camus a French Algerian author and philosopher, 1913 – 1960. “Don’t walk in front of me: I may not follow. Don’t walk behind be; I may not lead. Can you act this out and include dialogue to represent this quotation? Keep up the great work – this is an original, creative and USEFUL thing you have designed. Thanks very much, Jason, inspiring comments indeed. Love this idea. It’s use with the Camus quotation particularly works for me. I will use this in class. The kids are enjoying poetry and this is a simple poem but I know the children will have a lot to say about it! Hi Naini! Would be great to hear what they say! You are currently reading Walk beside me at language garden.